Taipei, Taiwan - November 17th, 2017 – Thermaltake Gaming Tt eSPORTS, the energetic and powerful challenger is delighted to announce the launch of the X FIT & X COMFORT Real Leather Edition Professional Gaming Chair. The X FIT & X COMFORT Real Leather gaming chair comes in a stunning all-black genuine leather covering found in top-level sport vehicles, coupled with elegant upholstery, the latest in ergonomic design, and use of top-notch materials for maximum durability, optimal form-fit and ultimate comfort. Make the X FIT & X COMFORT Real Leather gaming chair the best seat in your house with premium craftsmanship and luxury. The X FIT & X COMFORT Real Leather Edition gaming chair is fully covered in genuine leather for both the entire seat and contact areas; and is extremely durable, easy to clean, UV, aging, and temperature resistant for maximum longevity and use. The steel frame is surrounded by high-class cold foam that keeps its shape even after prolonged usage and is responsible for the chair’s ergonomic upholstery, which ensures an upright and simultaneously comfortable sitting posture that provides the X FIT & X COMFORT real leather gaming chair with the perfect mix of form, function, and durability desired by gamers. The X FIT & X COMFORT Real Leather Edition professional gaming chair is constructed with all the necessary adjustments and parts to support proper posture. This includes: chair with casters and five-point base, seat rest with dense foam padding, backrest with lumbar support, armrest with adjustable height and width, seat height hydraulic adjustment, and chair recline and tilt functions for maximum support and comfort for the user. The foundation of the X FIT & X COMFORT Real Leather Edition is built upon a thick 22mm diameter enhanced steel framework, that is super strong and durable to ensure utmost stability and reliability. It is covered with the use of a 75kg/m3 (seat back) and 55kg/m3 (seat base) density foam padding that provides enhanced ergonomic support for the body and does not lose shape over the long term. The foam is wrapped with the use of real leather for enhanced durability, breathability and splash resistance. The X FIT & X COMFORT Real Leather Edition gaming chair uses a premium grade Z-Support multi function tilt mechanism that provides adjustable tilt for increasing and decreasing tension by matching the body weight of the user for effortless, secure and sturdy rocking. The Z-Support multi function tilt mechanism provides improved support and stability of the gaming chair, which are only found in premium gaming chairs. The X FIT & X COMFORT Real Leather Edition has a multitude of functions for user customization. These include 4 directional armrests with height, left to right, side-to-side adjustment, adjustable back up to 160 degrees, powerful class-4 gas piston for easy height adjustment of the seat, sturdy aluminum 5-star base for improved max load support, and super large 3” caster wheels for enhanced base support, quieter operation and freedom of movement. X FIT Real Leather Gaming Chair suggested price USD 529.99. X COMFORT Real Leather Gaming Chair suggested price USD 549.99. 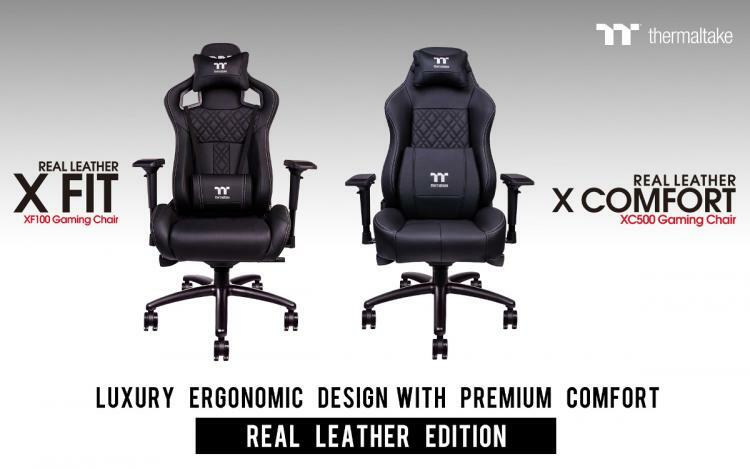 For more information on the X FIT Real Leather Gaming Chair, please visit: http://www.ttesports.com/productPage.aspx?p=284, or for information on the X COMFORT Real Leather Gaming Chair visit: http://www.ttesports.com/productPage.aspx?p=283.